All loose vintage action figures purchased from above links include our new thick baggie FREE. Complete figures also include our unique serial-numbered tamper-evident hologram seal to maintain authenticity. About 48 Back, 77 Back, 12 back, etc. 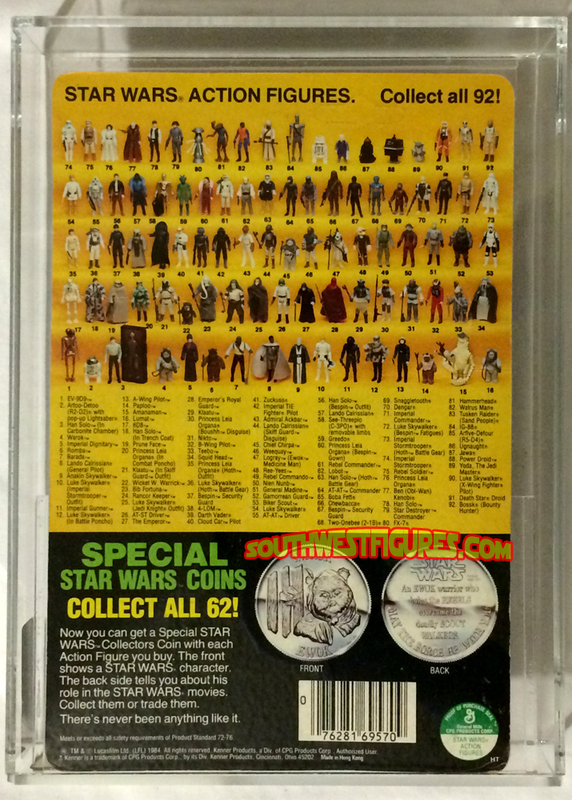 Vintage Star Wars action figures displayed the number of current action figures on the back of the card. 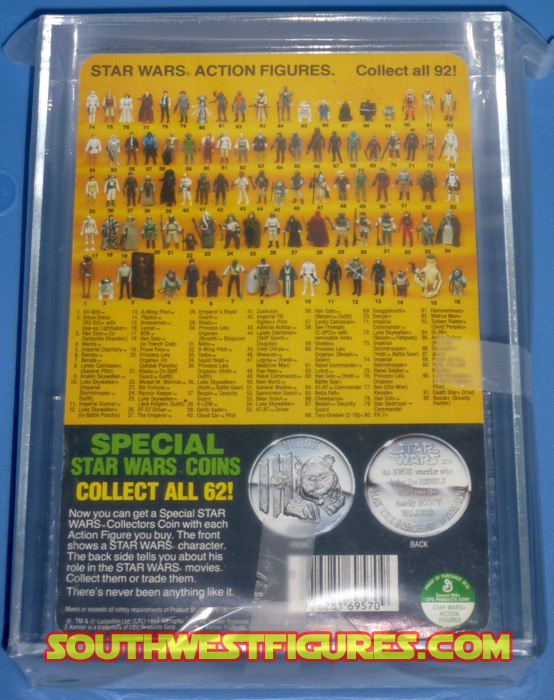 The first was the 12 back showing the original 12 action figures. By 1985, we had cards such as the 92 back, showing 92 action figures. This of course did not include variations. All AFA items come in a custom AFA sealed acrylic case with a unique verifiable AFA serial number and AFA hologram seal. 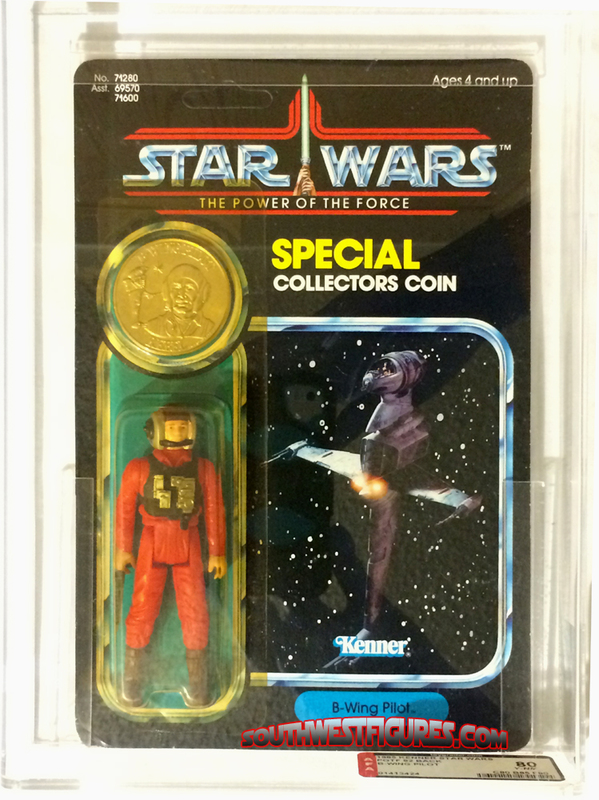 The original Kenner Power of the Force (POTF1) ran from 1984 to 1985 and was the last of the original vintage Kenner Star Wars figures produced until about 1993. 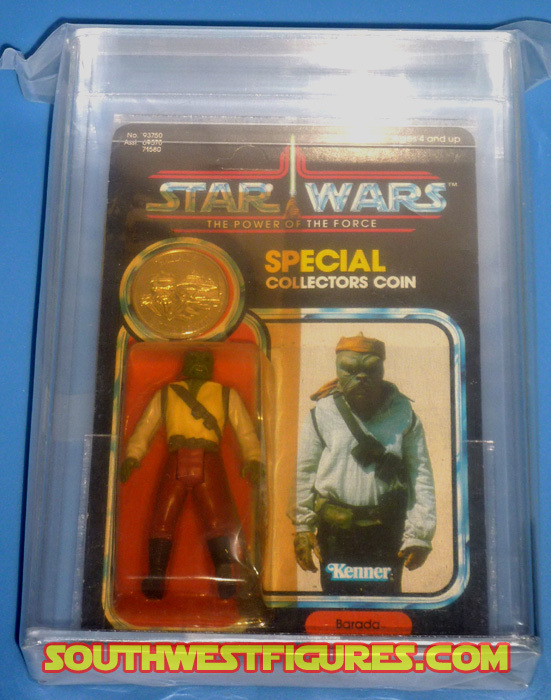 There were fewer POTF1 figures produced than the earlier series, and this was the only vintage series that also included a collector coin with a picture of the figure. The coins were either silver or gold in color. This series is highly sought after by collectors. Just the coins can be purchased here. Ewoks TV Series was another cartoon spin-off from Star Wars, Return of the Jedi. The show aired for two seasons from 1985-1986 with 26 episodes. The series featured the popular fuzzy Ewoks with Wicket W. Warrick taking the lead. The action figure series produced a limited number of just 6 (six) figures in unique packaging (shown on left in green). Photographed with thick plastic cover over acrylic case. Actual item is 100% transparent.